Pinaputok na Pompano ~ I Can Do That! Sometimes Filipino cuisine confuses me or maybe just the names of the dishes like pinaputok na isda (exploded or popped deep-fried fish). I've made this fish dish twice already following the recipe from KULINARYA guidebook. 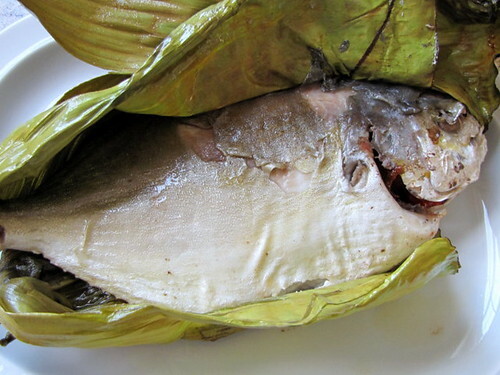 The fish is simply seasoned, wrapped in banana leaves, and deep fried. The fish does not pop nor make a popping sound while being cooked although the leaves make a few crackling sound. The fried fish doesn't become brown or crispy and almost looks like it was steamed. It's not greasy at all and has a nice flavor from the leaves; I like it specially with a relish of green mango mixed with spicy shrimp paste. i thought it was steamed...deep fried pala. oo nga, bakit kaya 'pinaputok'? 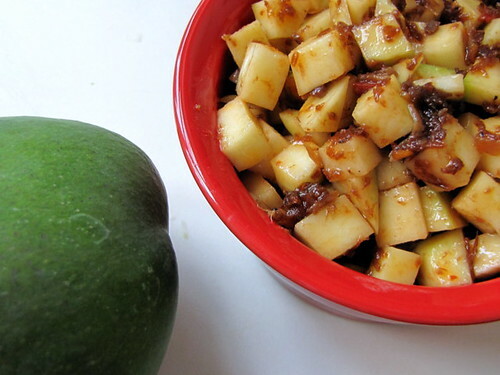 uhmm..that mango and spicy shrimp paste is making me drool!!! !